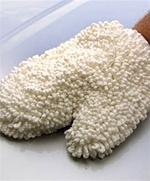 Use this micofiber mitt to make washing a breeze! Holds in the water, soap and suds really well. Its soft enough to use it on your horse or even vehicles!